Tuesday May 15 is our last class meeting. Read my guide to final exams, “Zen and the Art of Finals” (PDF), which will help you begin to prepare for our final (and hopefully others as well). It summarizes much of what was in my prep sessions. Think about major themes that we’ve been talking about all semester and bring questions to the class. We’ll spend the last class reflecting on the semester and have an open prep/ study session for the final exam with some group brainstorming, a little writing, and who knows what else. Be sure to show up. 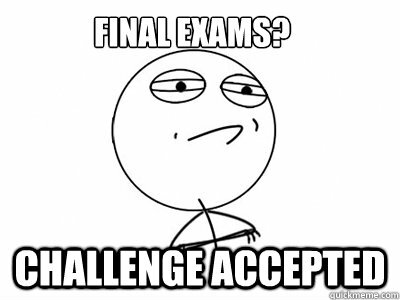 As a reminder, the final is scheduled for Thursday, May 24, 8-10 PM in the regular classroom. You might want to check Lehman’s exam schedule (PDF file) for your other classes as well. Be sure to arrange for childcare/ time off work/ whatever you need to do now, as there will be no make-ups, except for extraordinary circumstances. Unless you can provide a hospital or arrest record (your own, not a family member’s), you get no make-up. “My family bought plane tickets to go on vacation” or similar is not an extraordinary circumstance in my book. Consider college a job and be up front with family, friends, etc. about what that commitment means. My other class section is taking the test in the day, however. You can take it with them if you want–and are available. email me for details on that option. The CUNY Service Corps has an opportunity to travel to Puerto Rico this summer as part of a CUNY contingent to help with the rebuilding/recovery effort. It’s anywhere from a 2-6 week commitment between June and early August. Travel, food, and housing will be provided. You’ll also get college credit and they say a stipend will be offered. See the details at their website. Application deadline is May 13 so act quickly and interviews for those accepted are the week of May 21, so it’s all happening very quickly. The Venceremos Brigade is the Cuba travel option I mentioned. the application deadline already passed (May 1), but there may be space left if you apply immediately. Details/logistics/costs at the IFCO/Pastors for Peace website. They’re the ones who run the program. I can put you in contact with people who’ve gone if you’re interested. If it doesn’t work for you this summer, file for next year. They go every year.